The Seasonal Traditions Forum is a joint community of Halloween, Fireworks and Christmas. With many varied threads, We fully welcome everyone of all level of experience. Mods/Members are always happy to help with budgets, DIY and much more. Registration is 100% free. BFNT uses the Forum what lives on a different web address, to help connect with like-minded people. We decided Seasonal tradition is a good place to compile all the seasonal celebrations that people love, instead of going to different places. The forum offers more than just advice, it produces a fantastic variety of guides so you will always have the resource, no matter what. Help is always at hand if you are new to being on the forum. The forum itself is designed to be navigated easily, with users and mobile friendly in mind, you can access new post by click one button, and it offers a Superb chat if you don’t fancy posting a thread. Enjoy the fun and games, that gives you a break away from hot topics and spend time knowing your like-minded fellow friends. We have members from other countries, so you don’t need to worry if you are from the UK, U.S.A, We accept everyone and anyone, Exploring their experience to help you. By joining this fun community you are gaining access to much more than just 1 niche. Enjoy what the seasonal forum has to offer, Register today! Interested in something else? Try our last week post, Kanmon Strait Fireworks Festival Annual Tradition. 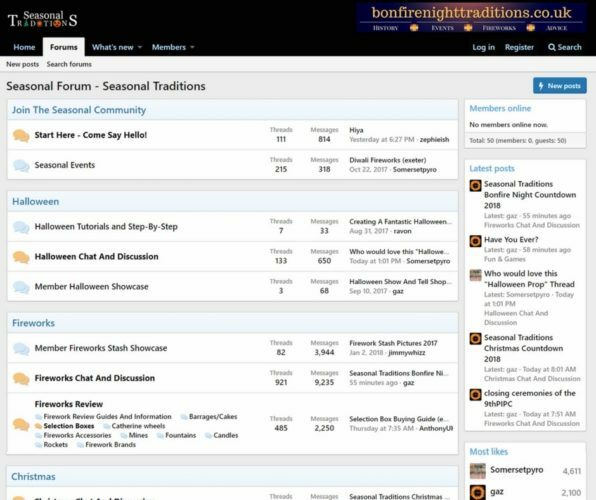 Did you enjoy this What’s New on Seasonal Traditions Seasonal Forum?. Please share it with your friends. Would you like more? join us on our Facebook group, where we share as much firework related content as we can muster.